Choose your brew! This 4-in-1 coffeemaker brews into a standard mug, a tall travel mug, a 5-cup* carafe, and it works for pour over coffee. The adjustable stand allows for brewing versatility, and the unique, removable brew basket lets you control the strength of your coffee when making a pour over into a mug or carafe. 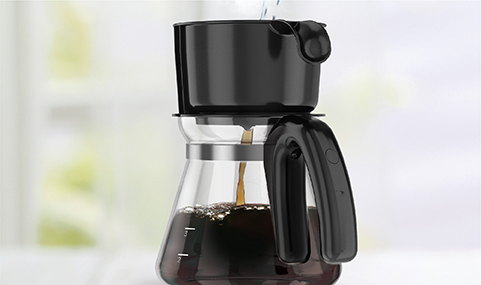 The improved carafe is designed for comfortable handling and drip-free pouring, and the lid is removable for easy cleaning. Plus, you get a 14-oz. stainless steel travel mug for taking your coffee to go. The adjustable stand lets you brew into a standard mug, a tall travel mug, the included 5-cup* carafe, and it works for pour overs thanks to the unique removable brew basket. The improved carafe is engineered for comfortable handling and drip-free pouring, with a removable lid for easy cleaning. Perfect for apartments, RVs, dorm rooms, and smaller coffee appetites. Remove the brew basket to create a delicious pour over that fits your tastes. 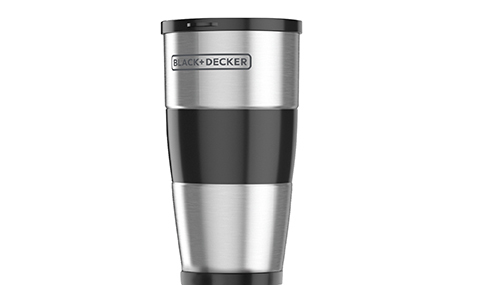 Take your coffee to go with the included stainless steel travel mug. No need for paper filters. The permanent metal filter works with your favorite coffee grounds and it’s easy to clean. 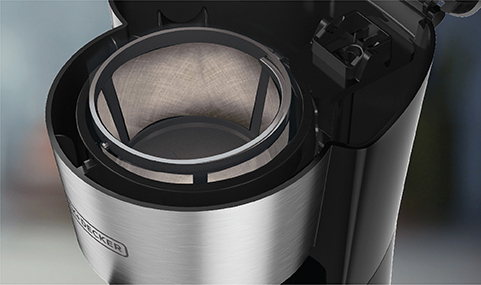 4-in-1 5-Cup* Station Coffeemaker, Black & Silver is rated 4.0 out of 5 by 157. Rated 4 out of 5 by jenplatts2004 from Awesome product So many great features to this coffee maker. I really like that you have different options for how you want to get your coffee. Quality product. Love the black and decker brand. I’ve been using this every day since I’ve received it and have had no issues. Love it! Rated 5 out of 5 by LiveLaughLuv14 from My morning savior! This Black and Decker Coffeemaker is wonderful! Small and lightweight but helps pack a powerful punch to my coffee in the morning. It is very quiet and quick and keeps my coffee warm. Can't ask for much more than that! Rated 1 out of 5 by Aunt Sib from sorry I purchased this I just purchased this as I needed a new coffee maker. It's going back to the store tomorrow for a refund! There is no warming plate to keep the coffee warm! I didn't realize this when I purchased it. I'll research and find a 4 or 5 cups coffee maker that has a warming plate. This one looks nice but not practical at all! Rated 1 out of 5 by LuvCoffee2Much from Nobody likes cold coffee! I got this for Christmas and wondered why my coffee kept getting cold so quickly then I figured it out! THERES NO HEATING PLATE! ...Looks like I'll be returning it to the store for a better coffee maker. Rated 1 out of 5 by MaryChristmas from No heating plate... I got this for my mother as one of her Christmas presents. Very disappointing that it doesn't have a heating plate. Never heard of a coffee pot maker with a carafe that doesn't have a heating plate. She's 87 years old and now after her 1st cup has to use the microwave. Not worth it. Rated 2 out of 5 by Mufasa from It’s okay Cute and good for 1 hot cup. But this coffee maker does not have a warming plate so by the time you come back for a 2nd cup the coffee is cool. Rated 5 out of 5 by Maggiegyver from Perfect for me!!! I purchased this coffee maker because I wanted exactly what it offered- options. I drink one cup of coffee a day. That’s it. So the brew to cup feature is perfect! I set it up the night before and just turn it on in the morning. I have seen reviews of people complaining that it doesn’t keep the coffee warm, but it says that pretty clearly. I make it when I want to drink it. It brews the perfect temperature. I also love that I can brew more than one cup if I have a visitor. I did buy paper filters, but that was more due to personal preference than anything wrong with the included filter. I highly recommend it! Rated 4 out of 5 by Meekdog from Whatever is best for you! When I first started using this coffee maker the basic way plugged in to the wall,the coffee turned out fine, but after moving plugging it up wasn’t easy so I used the drip option without plugging everything up and was happy with the results. we purchased this coffee maker and it worked fine the first day, threw away the box and receipt by mistake. The second day prepared to make coffee, the start switch lit up when pressed but nothing happened. We have tried again but it won't work. Can you use K-cups with this model? Does the 4-in-1 series CMO750 have automatic shut off? At what temperature does this brew? I bought this and made a cup of coffee. Afterwards we left for the day and came home to a coffee maker that was dry from the one cup I made but still trying to heat non-existing water. Is there no auto complete/off on this thing? Coffee does not stay hot.base is not hot?